Most orders ship within five working days of receiving your order. We will not charge your credit card until the day of shipment. Unless otherwise specified by you, orders are shipped via UPS Ground, FOB Duluth, Georgia (USA). Georgia Controls will only ship within the USA and to Canada. Please note that any shipments to Canada will incur import duties, fees and taxes. These import duties, fees and taxes are levied by the Canadian government. We have no way of knowing how much these charges will be, so we cannot give you an estimate. Packages shipped to a residence in Canada will be charged an extra COD charge by UPS. This COD charge is on top of the shipping amount that we charge. If we can ship to your place of business there will be no additional COD charge from UPS. Shipping charges vary according to destination, size & weight of packages. We will do everything possible to provide you with the lowest shipping charge possible. You pay only item price plus shipping and handling unless sales tax is required. There are no hidden charges. You will see the exact amount due before you submit your completed order. 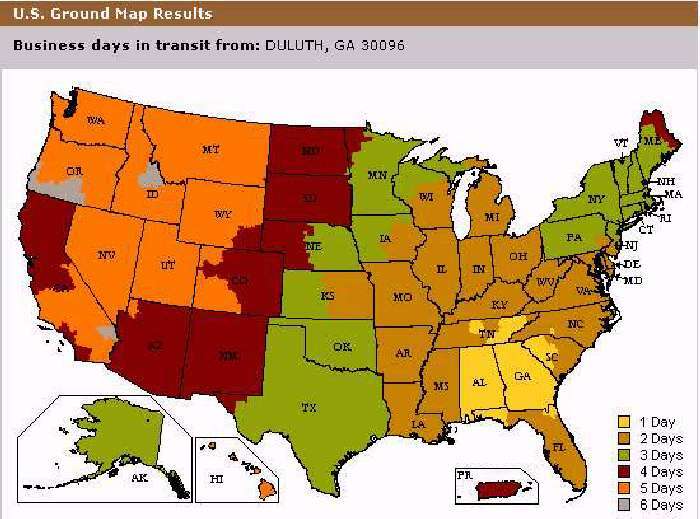 (Click here for UPS Time in Transit map) We are located just outside of Atlanta, Georgia. Click on the Time in Transit map to see how long your package will take in shipping. The Georgia Controls website uses Creative Cart, a secure shopping cart service, for your web purchases. Click on our buttons to add items to your shopping cart. Creative Cart uses an SSL (Secure Socket Layer) connection to collect your sensitive information. You can then be assured your purchase is secure. If you have questions about an order please feel free to email us, or call us at 770-476-7322. We are open from 9:00am to 12:00pm and 1:00pm to 5:00pm Eastern Time, Monday through Friday. Sales tax, for Georgia residents only, is 4% to 8% depending on ship-to county. We will be happy to trace any missing packages which were shipped via UPS. Notify us as soon as possible so that we may contact UPS and start the search. Prices listed are Suggested Retail Price and do not include shipping, handling, or sales tax (sales tax applicable for Georgia residents only). Your satisfaction is important to us. If there is a problem, contact us within 3 business days of receiving your order and we will work out the details of items to be returned. If items are damaged upon arrival immediately notify UPS or other shipper. Items shipped UPS are always insured. Returned items must be received in the same condition as when shipped to you. You will be refunded the cost of the item, not including shipping and handling. Returning the item will be at your expense. All returns require an RMA (Return Material Authorization) number. One year from date of shipment. Returning the item to Georgia Controls will be at your expense. All warranty returns require an RMA (Return Material Authorization) number. We accept Visa, MasterCard and American Express. Your credit card will be charged on the day of shipment of your purchase. Prices are in US dollars. We do not accept Purchase Orders on the web. Purchase orders may only be placed directly with the factory at 770-476-7322. Factory hours are from 9:00am to 12:00pm and 1:00pm to 5:00pm Eastern Time, Monday through Friday. Any information given to us is kept strictly confidential. We do not sell customer lists, mailing lists or surveys; or give out private information to anyone. We consider this information to be private and confidential. The only exception is if we are required to provide information to any law enforcement agencies. Georgia Controls ships everything via UPS from just outside Atlanta, Georgia. Note: UPS will NOT ship to a P.O. Box, APO or FPO address! This is not our choice, it is standard UPS policy.